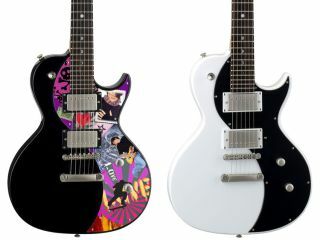 The Neo Series from Luna Guitars was conceived in an attempt to appeal directly to young musicians. Proving that Luna is well and truly down with the 'MySpace Generation' - although everyone but bands seems to be using Facebook now - the new Your Space guitar allows its owner to pimp it out to the max. Sweet. The instrument's clear scratchplate unscrews so that a collage - be it pictures, stickers, art, poetry, dried flowers, used train tickets, pornographic clippings, you name it - can be created underneath. Luna has also made an online template available so you can print out your favourite digital images and use them as the basis for your newly customised Neo Your Space guitar. This only confirms our belief that kids these days have it easy. What's wrong with a few clumsily-applied stickers, some gaffer tape and maybe a spray can?